We are delivering expert knowledge for market research and marketing for 40 years – in 2017 for more than 33 years under the brand planung&analyse. Since 1992 the magazine planung&analyse is – besides 90 other publications – published by dfv Mediengruppe. 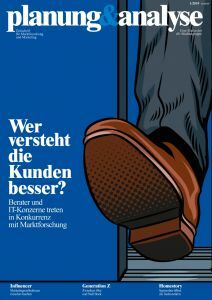 planung&analyse – Magazine for Market Research & Marketing is one of the leading magazines for market research and marketing and publishes six editions per year covering best practices and case studies on projects, concepts and methodologies. More than half of the readership are research buyers regularly seeking information on latest methodologies and possibilities for conducting market research. Our current circulation is 10,230 distribution copies. In addition the online portal www.planung-analyse.de provides the market research community with daily industry news and exclusive online contributions.